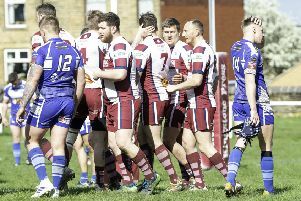 Tim Orrell made 36 to help Mirfield Parish Cavaliers maintain their unbeaten start in the Drakes Huddersfield League Championship with victory over Slaithwaite last Saturday. Moorlands gave Drakes Huddersfield League Premiership Champions Delph and Dobcross a scare before slipping to a 38-run defeat last Sunday. Excellent bowling from Moorlands restricted Delph to 172 all out — a total below par on the home side’s small ground. Darrell Sykes claimed 4-36, while Andrew Walker supported with 3-61 to keep the Delph batsman in check. Lancashire batsman Aaron Lilly top scored with 52, while support came from Nathan Jones (26) and Luke Proctor (25) but Moorlands were confident of inclicting a first defeat of the season on the champions. However, Shakir Muhammad produced a superb spell of quick bowling in reply as he claimed 7-47. David Winn (25) and Jared Maxwell (24) had offered Moorlands hope but they lost their last four wickets for one run as they were all out for 134 in the 36th over. Mirfield Parish Cavaliers recorded a fourth straight victory, defeating Slaithwaite by 38 runs and are level on a maximum 24 points with Almondbury Wesleyans at the top of the Championship. It was a great team batting performance by Mirfield Parish as Daniel Hope (53), Tim Orrell (36), Rashid Yousaf (33), Nazar Hussain (31) and Terence James (29) all made useful contributions as they posted 270 all out from 50 overs. Alikhan Jadoon (4-49) and Daniel Rushworth (3-32) were pick of the Slaithwaite bowlers. Slaithwaite were up with the required run rate throughout their innings as Chris Shannon (44), Max Berry (29), Abdul Rehman (24) and Alex Walker (21) all made good starts but were unable to go on and produce a match winning innings for the visitors. Hussain stormed back in style for Parish, taking 6-51 as Slaithwaite were bowled out for 232 in the 44th over. Mirfield slipped to a fourth defeat in the Conference, going down by 42 runs against Upperthong. William Oakley (68) and Russell Briggs (46) led the visitors to 186 all out, with Nasar Saudagar (4-35) and Beau McGuinness (3-57) impressing for Parish. Saudagar (37) top scored in reply but Mirfield were bowled out for 144.